Sign up for Broadjam today to follow Ordinary Peoples, and be notified when they upload new stuff or update their news! 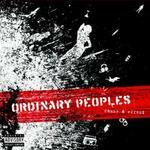 Ordinary Peoples continues to evolve into one of the most distinctive hip-hop voices to originate from the mid-west scene. On their 4th LP, "Cause and Effect", the band refines the styles absorbed from time spent in their centric location to take the listener through a series of musical foundations. Northern-underground, east coast grit, west coast g-funk, and southern gospel are all represented, giving the album variety while still remaining cohesive. OP produces in the studio the same blend between live instruments and rhymes that they've generated for years on stage, but couldn't fully capture on tape. Following 2003's "Urban Sprawl", "Cause and Effect" is more mature and personal; many of the songs depict experiences, thoughts, and occurrences that are obviously part of the band's daily lives. The group is not afraid to reveal their inner thoughts and struggles, ranging from the state of the world and hip-hop to girl trouble. On "How It's Goin' Down" and "Cause and Effect", Scraps shows off his ability for creative wordplay by rattling off scenarios that unfold the song's overall concept. "Brainwashed" and "Gas for Free" are more thought-provoking politically charged tracks which inspect and magnify current events. The album features several guest appearances: guitar work by long-time collaborator Jerry DePizzo (O.A.R.) provides depth while layers of turntables and horns spice up the beats further. The band passes the mic to acoustic baritone rhymer "Toothpick" (formerly of Bad Ronald) on the radio-friendly "Change My Luck", a song about hitting the reset button on a relationship. On "Nasty Girl" OP details sexcapade fantasies, passing the mic on a verse to the playful flow of Columbus emcee B. Yonest.